We recently had the good fortune to meet with Josh Malkin and Florence Scialom from the Network Of Wellbeing. We asked them to share the history, vision, and mission of the Network Of Wellbeing (NOW). What follows below is what they graciously sent. As you’ll see their work is vital to building healthy networks of networks that connect personal well-being with societal health and sustainable approaches to caring for the planet. NOW’s Chair of Trustees, Satish Kumar, also known as the “Peace Pilgrim”, makes clear “we cannot have personal well-being alone, isolated: instead, we need to connect with and care for each other and the earth.” He personally revealed a profound bridge as he walked from Gandhi’s grave to John F. Kennedy’s grave in a pilgrimage for peace in the 1960’s. We invite you to participate the NOW upcoming event “Building Wellbeing Together” taking place at Hawkwood College, in Stroud, U.K. during the World Peace Weekend September 22 through 24 (details below). NOW are great Champions of Compassion and we look forward to playing together! The Network of Wellbeing (NOW) has a vision of a world where everyone’s well-being needs are met within the planet’s natural limits. By wellbeing, we mean happy people, healthy communities, and a sustainable planet. We believe that people’s happiness depends in part on the health of the communities in which they live and work. This, in turn, depends on the fairness of society as a whole, and the long-term health of the natural world on which we all depend. In practice, NOW is building up a collaborative network of people and organisations who share our vision, providing inspiring blogs, videos and events, plus supporting actions to improve wellbeing in community settings. As part of this work, we are running a Building Wellbeing Together Weekend from 22nd-24th September in Hawkwood College, Stroud, UK. It is so brilliant that this event is happening at the same time as the World Peace Weekend, and we plan to weave messages of peace and compassion throughout our event. There are a few tickets and bursary discount spots still available, and we’d love you to join us! We see wellbeing as being more than personal wellness; the wider contexts in which we live, work and play are crucial in generating (or undermining) the wellbeing of all. NOW’s Chair of Trustees, Satish Kumar, makes clear that we cannot have personal wellbeing alone, isolated: instead, we need to connect with and care for each other and the earth. Although our organisation is only a few years old, the roots of NOW go back a long way. Our Chair Satish Kumar was known as “the Peace Pilgrim” in the 1960s, because he walked, with no money, from the grave of Ghandi in India to the grave of Kennedy. On the way he met politicians and heads of state in a number of countries – including the USSR, France and the UK – on his personal campaign for peace. Satish has been central in establishing the leading environmental publication Resurgence Magazine and the incredible education centre Schumacher College . More recently, in 2012, he linked up with wellbeing enthusiast and philanthropist Nigel Woodward and this connection resulted in the creation of the Network of Wellbeing (NOW). NOW’s approach is to build a network of individuals and organizations committed to the understanding and practice of holistic wellbeing. Our forthcoming event, Building Wellbeing Together, is an example of this. The weekend is a participatory conference at Hawkwood College – beautiful Edwardian country house in Stroud, only one and a half hours from London by train. This event will explore how we can we build wellbeing together, in our own lives, in wider society and in harmony with the natural world. The programme for this event is packed with inspiring talks, participatory workshops, mindfulness exercises and more. 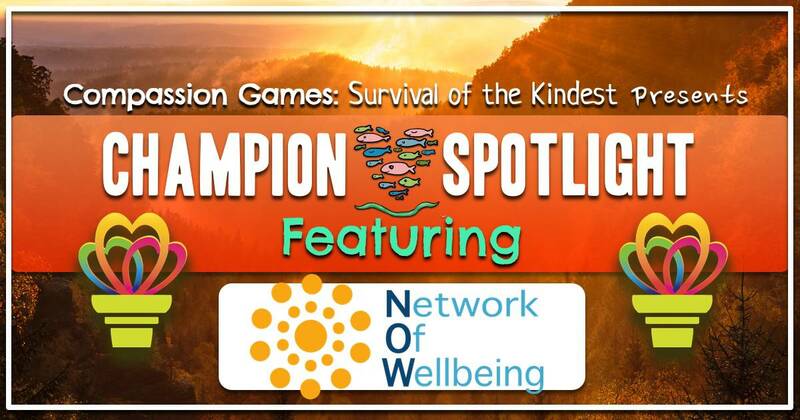 We will theme some of our mindful moments around compassion, to honour the work of the Compassion Games and the World Peace and Unity campaign, and we will share updates via #WellbeingTogether on Twitter, so if you’re unable to join us on person please check out updates online! Like @Network of Wellbeing – NOW on Facebook. Find the Building Wellbeing Together Facebook event here. Find the full programme, speakers, location and ticket information here. To book, simply fill out this booking form and someone will contact you to confirm your place. To follow updates online, check out #WellbeingTogether on Twitter.